Sick & Tired Of Dog Chewing? Had enough of your dog's annoying & destructive chewing behavior? Learn from the professionals how to curb dog chewing! Learn how to take control of dog chewing. Dog training for chewing, digging, biting, aggression & more. One of the worst habits that any dog can pick up is chewing. In addition to being destructive to your property, a dog that enjoying chewing can often injure himself by breaking teeth or swallowing chewed items. 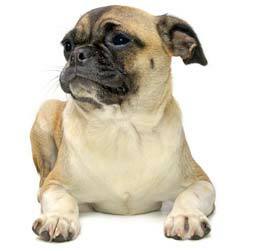 Furthermore, some dogs chew on themselves, causing hair loss and serious infections to areas of their bodies that include tails, legs, and feet. If your dog is a chewer, work to immediately correct the situation instead of dismissing the act as a typical dog behavior. It is a fact that puppies chew. However, what they chew is directly dependant upon you. If you are welcoming a new puppy into your home, be sure to provide it with adequate toys to prevent your pooch from destroying your home, car, or wardrobe. Furthermore, be sure to choose toys that cannot be mistaken for those "out of bound" items. Many dog owners choose to provide there pups with cast off shoes, then wonder why the puppy chewed up their brand new pair instead. Look to bones and toys that are meant to be used as a chewing toy and will not splinter, break, or split and potentially cause a choking hazard. Also, provide your puppy with several different toys in various areas so that he does not become bored and opt to gnaw on your furniture instead. For starters, the easiest way to stop chewing is to keep an eye on your dog. Dogs cannot chew up your house and home while you sit watching them. Vigilance is a huge part of dog ownership. Furthermore, consider confining your dog to room or area of your home until you can trust him to have free rein of your abode. In addition to vigilance, cleanliness is a large factor in what a dog has access to chew. Simply put, your dog cannot chew your shoes unless they were left accessible. If you find your dog chewing something, if possible, place it out of his reach. In all likelihood, he will continue chewing the same item until it is either removes or completely destroyed. Larger items like furniture, doors, or appliances are unable to be moved. For these structures, apply a thin film of Bitter Apple. Like its name suggests, this solution is quite bitter and very unsavory for dogs. Available in a spray or cream, Bitter Apple will not damage the finish of your furniture and can easily be wiped away once the dog learns not the chew. Additionally, if your dog does ingest the material, it will not make him sick, as the recipe is non-toxic. Finally, serve as a guardian of your own items. Teach your dog commands like "leave it" and instruct him to cease and desist the gnawing of your items. Use a spray bottle or a shaker device instead of physical punishment, which can often cause dogs to become more destructive in protest. If your dog is chewing on himself more than your home, immediately visit your veterinarian. There are a number of skin conditions, including parasitic infections that can cause a dog to chew on his skin in order to find relief. Turn to a cooling spray that will provide relief as the area begins to heal. Also, use an antibiotic cream to prevent infection. Stop Your Dog's Annoying Chewing. Advice from top Dog Training Experts. Take Control of Dog Chewing & Save your Expensive furniture.